Wendy is a friend who lives in Ardrossan, a small town on the east coast of the Yorke Peninsula (about 150 km from Adelaide). She and her husband have a boat and they often go fishing. I too have gone fishing on their boat and watched them catch fish, mainly King George Whiting, Squid and Garfish. To make me jealous and as a subtle way to suggest I should go to visit them, she sent me a photograph of a large Australian Salmon she caught recently; she then sent me more photos of how she cooked it. Australian Salmon belongs to the perch family (surprisingly it is not a salmon). As you can see from the photo Wendy has filleted the fish. Some people find this fish very fishy, but it lends itself to recipes with strong accompanying flavours. 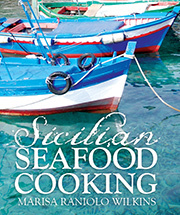 Wendy chose a recipe from my book, Sicilian Seafood Cooking. The recipe is Fish alla ghiotta from Messina and is cooked with tomatoes, green olives, capers, pine nuts and currants (AGGHIOTTA DI PISCI A MISSINISA – PESCE ALLA GHIOTTA ALLA MESSINESE). There are many variations of this dish and this one contains Sicilian flavours in excess – it is sure to satisfy the gluttons. Sicilians use piscispata (Sicilian for swordfish; pescespada is the Italian), but any cutlets of firm, large fish cut into thick slices or thick fillets are suitable. 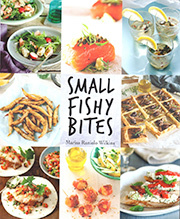 I like to buy sustainable seafood and have used: Flathead, Trevally, Kingfish, Snapper, Mackerel and Barramundi. Obviously Australian Salmon can now be added to this list but in Victoria I have not seen much of this fish. 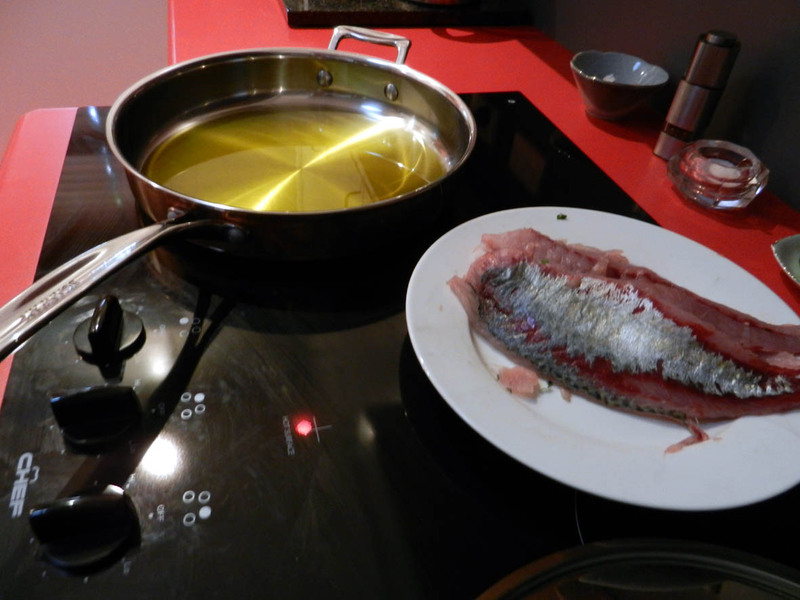 Heat the extra virgin olive oil in a wide pan, large enough to accommodate the fish in one layer. 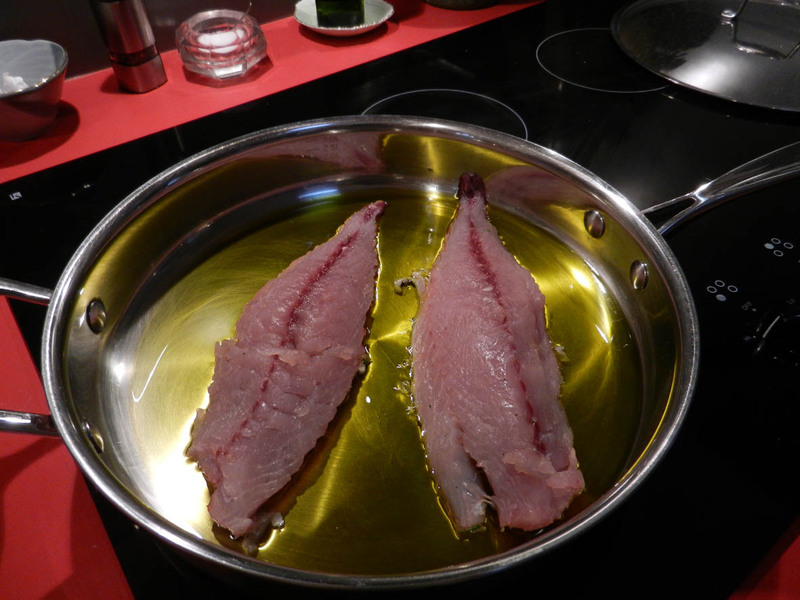 Shallow-fry the fish for a couple of minutes on both sides over medium-high heat to seal. Remove from the pan and set aside. 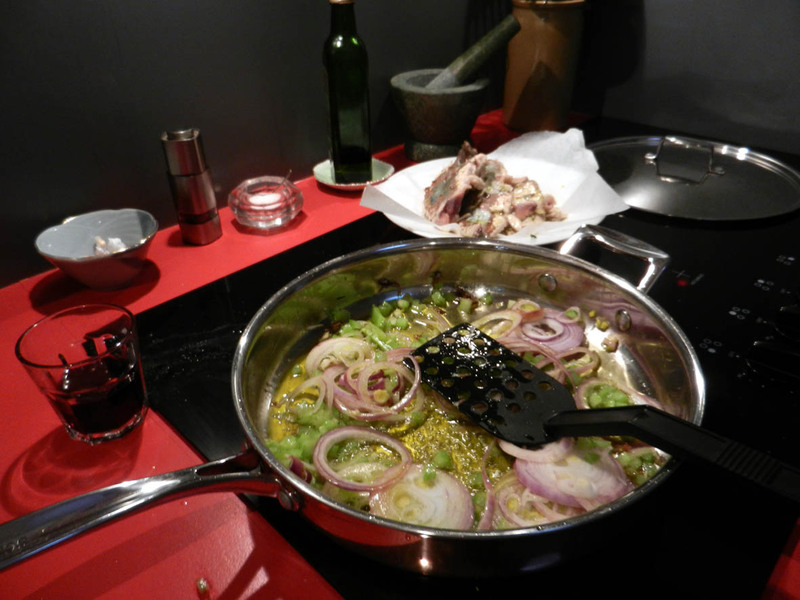 For la ghiotta, add the celery and onion to the same oil, and cook until softened, about five minutes. Stir frequently. Reduce heat to medium, then add the capers, olives, garlic, currants, pine nuts and bay leaves and stir well. Add tomatoes, season, stir, and cook for about ten minutes until some of the juice from the tomatoes has reduced. Arrange the fish in the sauce in one layer and spoon some of the sauce over it. Cover, and cook on moderate heat until the fish is done. Thank you Wendy for all of these wonderful photos and I am so glad that you enjoyed it.